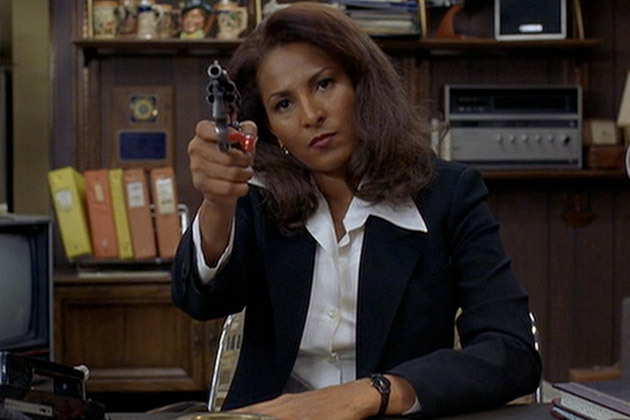 For all of Quentin Tarantino’s female characters, there are none that his camera insists we love and champion more than 1997’s Jackie Brown, played by Pam Grier. The film is a tightly focused homage to Grier and her career as an action heroine with all the admiration of a wide-eyed movie nerd who watched her on the big screen in the 1970s, but it is also a hard-edged examination of what it means for a black woman getting older in the business – that being the criminal world of the film and Hollywood in real life. Grier was 48 years old in 1997, playing a 44-year-old flight attendant running out of options and embroiled in a situation where men are literally surrounding her for their own gains, and her character has to fight every second to preserve the tenuous balance of desperation and fear and still remain flawlessly cool. Hers is a reserve that tests the pressure of her scenes so steadily that when she gains the upper hand, the audience laughs and cheers just so the steam can escape from our heads. 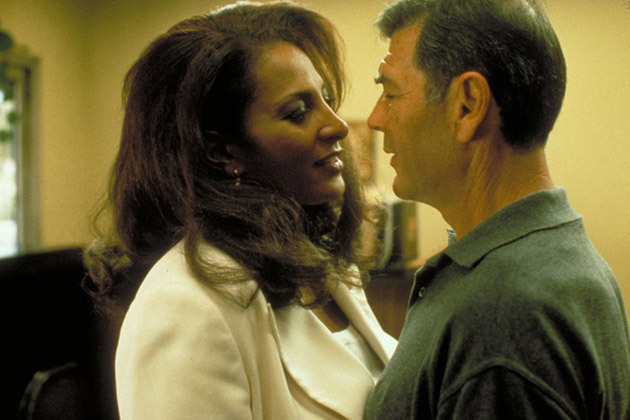 Adapting his screenplay from the Elmore Leonard novel Rum Punch, Tarantino changes the name and race of Leonard’s heroine, the blonde Jackie Burke, to the African-American Jackie Brown. To watch the film now, could he have used a white actress? Tarantino has a gift for matching strong actresses to strong characters, but here he chose Pam as a dialogue between what was and what is, what the actress and the character still possesses and the forces trying to prevent her from using it. Were there many lead roles for black actresses in the mid-90s, especially in the action or crime genres? How about actresses over 40? 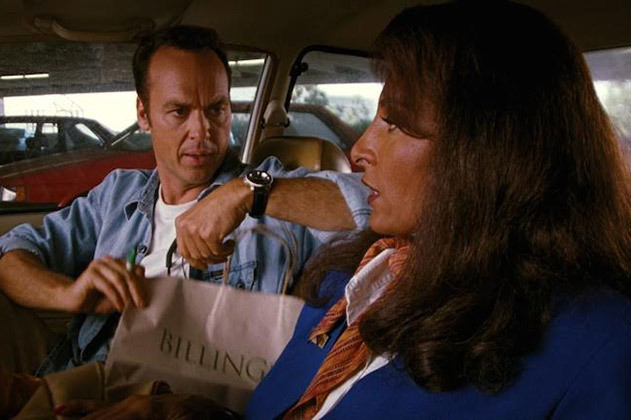 To watch Jackie Brown then, when I was seventeen, and now in my mid-30s, is to gain a whole new perspective on the comments about her time running out. The film opens with a languid, three-minute tracking shot of our titular character in a bright blue suit gliding along a moving walkway in an airport, her lithe frame standing perfectly straight against tiny blue, green, and beige tiles, hair and makeup on point. Set against Bobby Womack’s song of the hard life “Across 110th Street,” we simply watch her amble towards her gate at a low-budget airline shuttling tourists from Los Angeles to Cabo San Lucas. Tarantino shoots Grier from low angles to showcase the intimidation she can bring by her natural height (5’8”) made even taller by heels, steadily focusing on her composure and carriage as she catwalks through the terminal. She only hurries as she nears her flight, delaying her participation in a substandard job as long as she can. She’s too good for the job, and by the time the customers start to board, we all know it. Working for the lowest tier of airlines hardly pays the rent, so Jackie shuttles money in and out of Mexico for arms dealer Ordell Robbie (Samuel L. Jackson), who fancies himself the Escobar of international gun trade. Unfortunately, his blustering has caught the attention of both LAPD and ATF agents who see Jackie as the carrot to lure Robbie. She is as disposable to the law as she is to the criminal – her survival lies in what she can bring to each. As vulnerable and precarious her situation is, Jackie’s confidence and poise serve to either infuriate or arouse the men around her, as their responses come as mockery, lust, or awe. She responds to pressure with strength, her gaze never faltering, and that is unnerving to those who seek to put and keep her in her place. Watch the scene where she is discussing her few options with LAPD officer Mark Dargas (Michael Bowen) and ATF agent Ray Nicolette (Michael Keaton): as the men position themselves in front of and behind her, trading the lead in their interrogation into her personal life and involvement with Ordell, the camera stays on Jackie’s face, capturing its reactions. It matches the intensity of Sharon Stone’s interview by the San Francisco police in Basic Instinct, except the focus here is more northward on her eyes and body language as she assumes the defensive but refuses to let them break her. In that one conversation, Jackie realizes her predicament not only from how Ordell has treated her, but how the police intend to handle her as well. It isn’t until we see bail bondsman Max Cherry (Robert Forster) come to the county jail to retrieve Ms. Brown that we watch someone truly match Tarantino’s awe of her, standing in the dark watching her slowly walk down the corridor towards the exit gates, her legs silhouetted by the yellow security light. He is the gentleman of this piece, and he is the one who truly sees Jackie for who she is without judgement. For most of their scenes together, Jackie is either in her airline uniform or casual, sporty clothes (or even a terrycloth robe). She meets the other men clad in short dresses cut to accentuate her curves and décolletage, as when she meets the fawning Nicolette for dinner, but with Cherry her look is less prepared and more natural. Of course, every action and look on her part is planned in accordance with how she perceives each man and how he regards her. The entire time, her focus is on survival, no matter how the players or rules change, and her intelligence and streetwise intuition enable her to stay one step ahead. From that lovely first sequence on, our faith is in Jackie. The tension of the scene in her darkened living room as she and Ordell discuss trust and betrayal is broken almost to the point of exuberance as she pulls a gun (which she stole from Max’s car) on Ordell before he can do the same. How she turns the tables and brings the full Foxy Brown on her shocked employer, yet effortlessly cools down and proposes a deal to his dumbfounded acquiescence, is the performance that is pure truth, devoid of the act and costuming she must apply for the rest of her confidence game. The songs played as Jackie maneuvers her way through the scam speak of the anxiety she confides in Max: of being scared to start over yet again and being tired to do so, of feeling the barriers that age can erect on a woman already burdened by inequality and opportunists waiting to take what they can. In “Street Life,” Randy Crawford sings, “You better not get old…(there’s) a thousand parts to play, until you play your life away.” By the film’s final act, bolstered by her own plan, Max’s help, and a killer black suit, she sets the pieces on the board and begins her strategy, reliant on the knowledge she has gained of each man’s motive and nature to ensure they get their pieces while she keeps hers. We never doubt her ability to remain a complete badass and still keep a sense of humor, as in the scene where she prepares to face Ordell and calms herself down by practicing her facial reactions and whipping out her handgun á la Robert De Niro in Taxi Driver. As in the opening scene, Womack’s “Across 110th Street” ends the film with its lyrics of survival and strong versus weak characters that populate street life, the song now diegetic as Jackie sings along to the radio in her car, having finally regained control and options in her life. It ends with a hopeful tone that things will get better for her as she begins life anew, but as she sings the lyrics, her eyes reveal that anxiety is still there. Brooke's first theater trip was to see Close Encounters of the Third Kind, which taught her to sit still and absorb everything in the story, from sound to light to faces, and that each person's response is colored by their life and experiences.